Easy healthy recipe with a Greek Yogurt! Yes, you can do it, and it tastes so good! When I tell someone I am a huge fan of Greek Yogurt. They say: really: it tastes so plain and it is so thick! How can you eat it? Not only do I eat it but I love it! We buy around 12 Greek Yogurts per week! I add it to my whole grain crepes, bake delicious healthy muffins, eat it with a bowl of fruits and maple syrup! But my favorite way to enjoy a Greek Yogurt is in my morning smoothie! I started this morning smoothie routine few weeks ago as part of my way to get back in shape for summer (and after a long long winter). It gives me that boost in the morning that keeps me going, without adding extra calories or guilt! 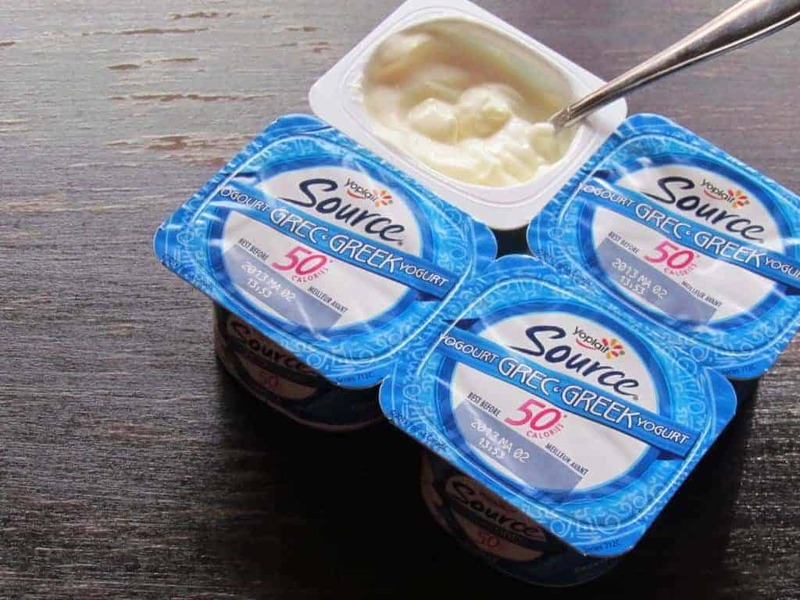 So when I was offered the opportunity to try the new Yoplait Source Greek Yogurt, I was curious to taste it and see how it compares to the other brands I tried before! When I went to the grocery store to buy it for my easy healthy recipes, I was a bit confused. I didn’t know what flavor to choose. They have 7 flavors! From creamy Vanilla, to zesty lemon, Peach! I decided to choose Vanilla because I want it to compare to the other Greek Yogurts I am used to! They come in a single serving of 350g or in packages 4*100 g or 8*100 g. I liked the package of 8 because there were two flavors in it. It is also convenient for larger consumption. Results:It is only 50 calories, twice the protein and no added sugar! Besides, I find it very tasty and creamier than the other ones I am used to! It is more fruitful! And it lived up to its promise! I highly recommend it! Mix all your ingredients in the blender. I usually start with the solid, then add liquid! Et Voila! You have a delicious healthy recipe that will give you plenty of energy for the rest of the day. Do you have an easy healthy recipe with Greek Yogurt? Share it with me!! 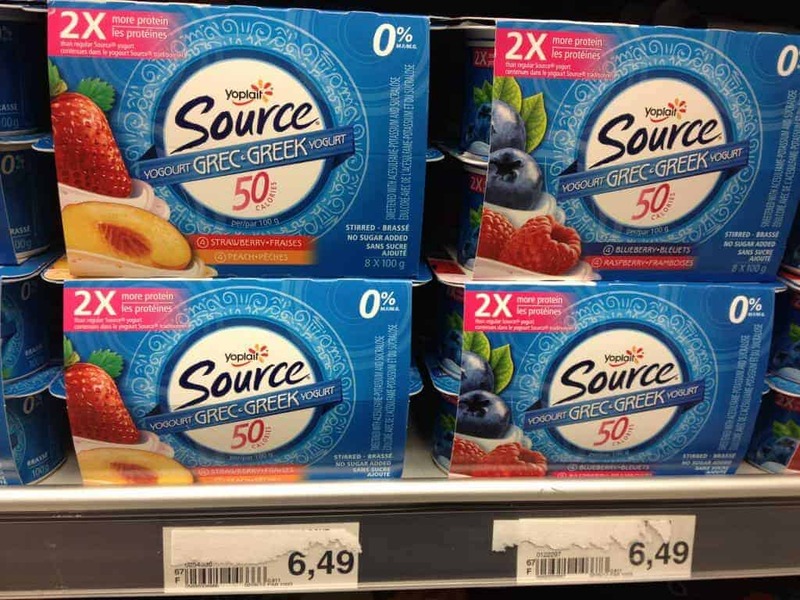 Giveaway: WIN 4 coupons for Yoplait Source Greek Yogurt and a $100 Gift Certificate for Lululemon!! Disclosure: I am part of the Life Made Delicious Blogger program and I receive special perks as part of my affiliation with this group. The opinions on this blog are my own. Thanks for the giveaway… Strawberry !!! I’d like to try lemon. I’d love the peach one of my absolute favorites. I would love to try the Peach. I’d like to give lemon a try. Good luck everyone! I would like to try the peach or vanilla first. I’d like to try the Peach. Greek Yogurt would love to try – coupled with two of my own favorites granola and cranberries ! I always try blueberry first when I get new yogurt! I’d love to try the strawberry or vanilla flavors! My faves would be vanilla and peach. I would like to try lemon flavor! I would love to try the Cherry Pomegranate Greek Yogurt. I’d love to try the raspberry!! I’d like to try blueberry. I would like to try the creamy vanilla first. Its the easiest to use in smoothie recipes! My absolute favorite thing to use greek yogurt is – tzaziki – when you use Greek Yogurt you don’t have to drain it for hours. Just add garlic, and drained grated cucumber & you’re good to go. I would like to try lemon and vanilla! Would love to try Blueberry! Thanks so much! I’d love to try the Peach. My favorite yogurt flavour is vanilla bean. I would like to try the zesty lemon – sounds yummy! Lemon would be my pick! I would have to go with raspberry. I’m looking forward to trying the new lemon flavour – that’s a pretty rare variety as far as flavoured yoghurts go. I want to try peach! I would love to try lemon. I would love to try Strawberry!!! I would love to try lemon! I love raspberry. That would be choice. Zesty lemon sounds very nice to try. I would like to try the Strawberry flavor! I’m a strawberry girl at heart… But I find that vanilla works best in my smoothies. i would love to try the blueberry. i pretty much like all flavours of yogurt, even plain. I would like to try Strawberry! I am trying Coconut one! I would love to try the lemon. Blueberry is my favorite yogurt flavor, so I’d try blueberry. I would love to try the strawberry and peach flavours. i’d love the vanilla and my daughetrs love the strawberry!! THe lemon for sure, but I would first have to look at each and see which one has the lowest sugar content. Can you tell us? I usually enjoy vanilla yogurt because I can mix it with anything, so I would like to try that. Vanilla is my first choice, then peach! I’d like to try the Strawberry and the Pineapple and Mango! All the flavours look great but I’m most looking forward to tying the strawberry. I would love to try either the lemon or the peach. I’d like to try the vanilla! I’d love to try the Peach flavor. Guess Vanilla would be my fav! I’ll be most interested to see what the plain tastes like. I would love to try the Peach Greek yogurt. I know it sounds boring but..plain would be my choice! Mmmm blueberry or kiwi all the way!!! I’d like to try peach. I’d like to try vanilla and peach…my 2 favourite flavors! I would like to try the black cherry flavour. SO MANY FLAVOURS…Would LOVE to try Triple Berry Torte! yum!!! I’d like to try the peach flavour. I love the vanilla maybe with some granola! Would love to try the lemon selection. Thank you. I’d like to try Creamy Vanilla. I’d like to try the lemon. I’ve never tried any Greek yogurts in Peach, so that’s what I’d like to try. I’d like to try the peach Yoplait Source Greek Yogurt! I think Strawberry for me! I’d like to first try the blueberry. Peach is probably the first choice at our house. The smoothies sound delicious. I would love to try the Zesty Lemon and I will make your smoothie! I would like to try the vanilla flavor. I’m not used to greek style yogurt, so I would want a flavor that I am used too. Glad that was the one you reviewed. 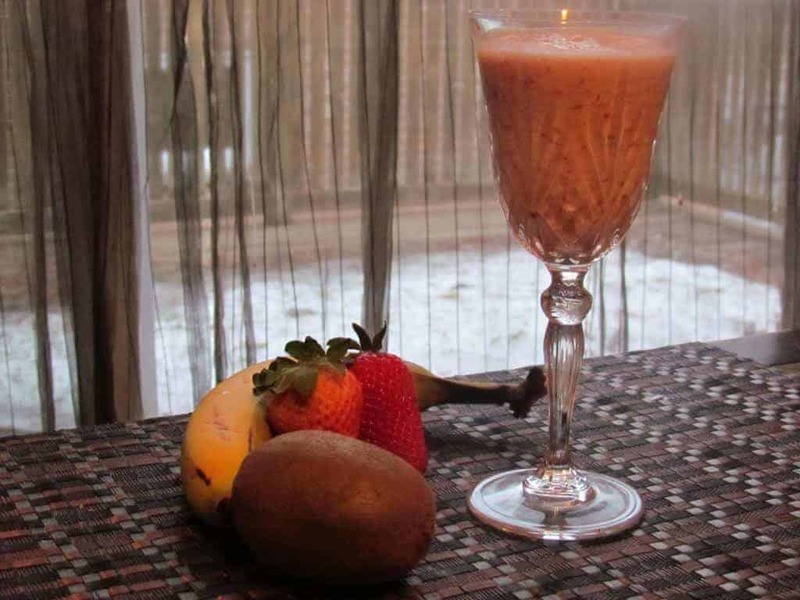 Your smoothie recipe sounds fantastic!! I’d like to try the Strawberry. Love the Vanilla and Hubby loves the keylime and the lemon. I wold like to try strawberry next! Had Vanilla for breakie yesterday & today with strawberries and bananas YUM! I can not wait to try out lemon. I’m interested in trying blueberry flavour first…then raspberry! My Ultimate Bahama Islands bucket list! What’s yours?